What do you make of India's under-performing, poorly-funded, leaky public health system, smothered by high population and appalling sanitation? It is the same health system, by the way, which has helped raise life expectancy from 32 years a few decades ago, to more than 65 today. What do you make of a health system which pulls off the remarkable feat of eradicating polio - India was home to four-fifths of the world's polio cases in 2002 - in a decade, but where women continue to die delivering babies and during simple sterilisation surgeries? So does India's health system - like many other things in the country - do the big things well and fare badly in executing the relatively smaller ones? Surgeon and writer Atul Gawande, who loves grappling with such gruelling questions, believes India's public health system is one of the "most complex things" in the world. And then, in a calm and measured tone, he proceeds to tell you a personal story to illustrate public health's chequered journey in the world's second most populous nation. This is a country, he tells me, where his grandmother died of malaria before the age of 30, at a time when she had no access to malaria drugs that were then becoming available. His grandfather, however, lived to the ripe age of 110, in the same village in Maharashtra. His aunts didn't die until into their nineties. "Simple things like clean water, more irrigation, more crops, more affluence added years to people's lives here. Public health, sanitation and antibiotics also helped," he says. But with Indians living longer, their needs have become wider. A health system designed primarily for infectious diseases was finding it difficult to cope with a new and more complicated swathe of illnesses - from high blood pressure to diabetes. "The top killer in India is death from cardio-vascular diseases. We are still in an economy with an infrastructure which has not progressed yet to meet the needs of someone who comes in with a heart attack, requires an operation, and wants it be done safely and well," he says. 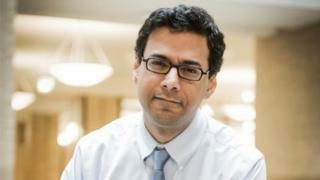 Dr Gawande, the son of immigrants from India, wears many hats. In the operating theatre, he practises general and endocrine surgery. In the medical school lecture theatre, he teaches health policy and management. Outside, he is a writer of best-selling books, mostly riveting essays on the challenges and tricky ethical issues facing modern medicine and about doctors and their mistakes. His recent book, Being Mortal, is an exquisitely crafted and courageous meditation on ageing and death and how doctors can help patients deal with end of life. "Polio was a big thing, and India made it a small thing," says Dr Gawande, 48, who was in Delhi last week to deliver the last of this year's BBC Reith Lectures. "They got the basics right." Authorities got the vaccine, kept it cold, and made sure volunteers go house to house, village after village, and offer vaccines and track and monitor the vaccination drive. How did India even make this happen? "Well, India was being very systematic. There was a clear message that we have a goal, we are in it together to eliminate the disease. I actually learnt the checklist idea by touring with a WHO [World Health Organization] polio eradication team in Andhra Pradesh," says Dr Gawande. The result was his book The Checklist Manifesto: How To Get Things Right, an old-fashioned, nine-chapter checklist primer for doctors to cut complications, infections and hospital deaths. "Eradicating polio took over a decade. One of my favourite sayings is by Bill Gates: 'We overestimate what we can accomplish in two years, but we underestimate what we can accomplish in 10.'" But on the flip side, many lives are still lost during simple surgeries and treatments, something which Dr Gawande puts down to a "functional failure in the organisation and operation in how our [Indian] systems work". "You have very good people with a lot of experience and good training in India. But if you put some of your best and smartest people in dysfunctional systems, it's demoralising for them and it is unsafe for the others. The easy thing to say is that this is a bad doctor and he will be punished and that will solve the problem. But we all know that it is not the case," he says. The death of 15 women at two state-run sterilisation camps in Chhattisgarh last month is a painful reminder of how India is not getting its essential public health care checklist in order - poor hygiene and contaminated drugs have been blamed. "The Chhattisgarh incident may be the result of contaminated drugs and production chains along the way, and it just goes to show how complex the system is. Having a great doctor only gets you so far if you are not building the checks and the system for how our drugs, or devices, even our cleaning of the operating rooms and the hospitals, how the basic hygiene is done," says Dr Gawande. We talk about his new and most compelling work so far on mortality, and about building a health care system that will "actually help people achieve what's most important to them at the end of their lives". India, says Dr Gawande, is going through a "remarkable transformation" that reflects the breakdown of the family that comes with economic progress, as evident by the rise of retirement complexes and old age homes. The young, having gained economic freedom, are no longer tethered to the needs of the old, and they follow opportunities without really having a plan for their ageing parents. "The plan becomes - the medicines will take care of it. So [the parents] end up in hospitals; we find institutions which really don't recognise them as people. I think we've had a failure of imagination [around the world] about what a good life might be for those last years we are all going to have." Things will improve, he believes, when more Indians will have access to pensions - "becoming old doesn't mean becoming poor" - and simple things like pain medication. Isn't it a bit ironic, he asks, that although India is one of the largest producers of morphine in the world, a patient in acute pain often finds it very difficult to procure it. Ageing is a journey each of us must navigate. In the end, Dr Gawande has a Zen-like prescription for people like me who are getting on in years: "You live longer only when you stop trying to live longer." I will remember it.